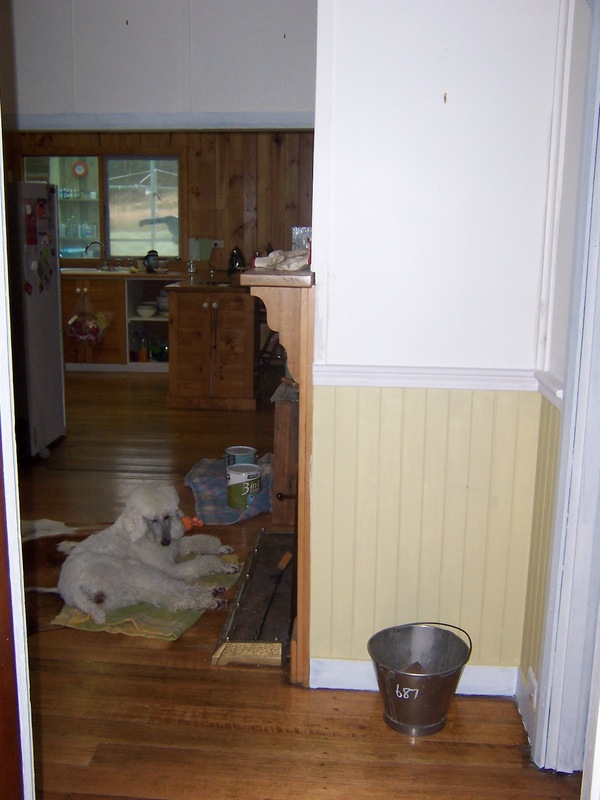 Remember the unfinished dado rail from the living room make-over? 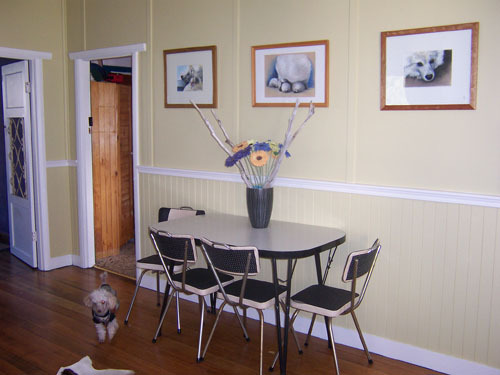 Well, the dining room was also painted white (I think the original owners of the house bought it in bulk and used it on everything), with a blue dado rail running around the entire room. 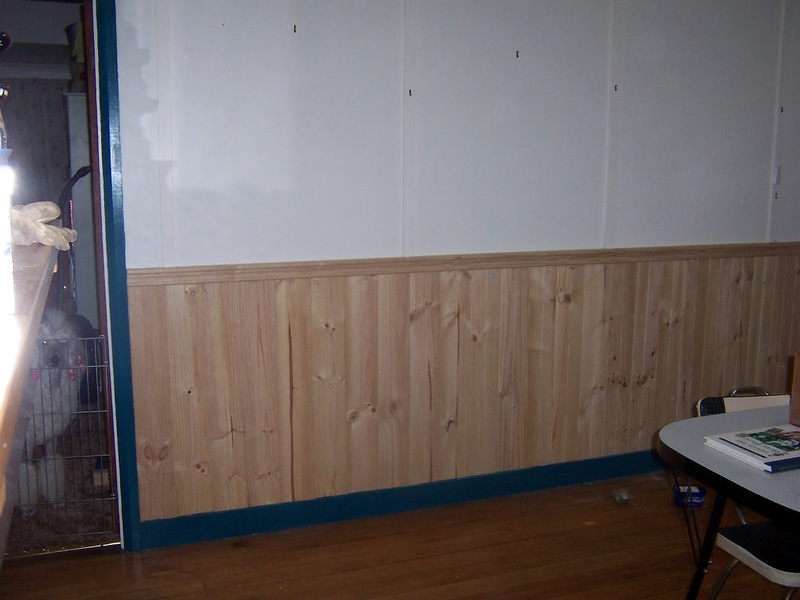 And only one tiny corner done in pine panelling. 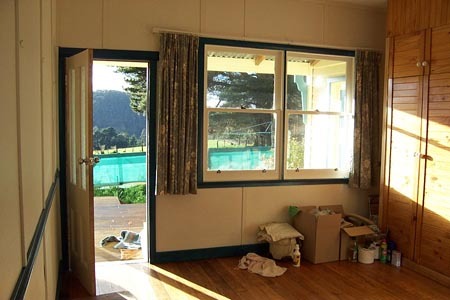 This is what the dining room looked like when I first saw the house. 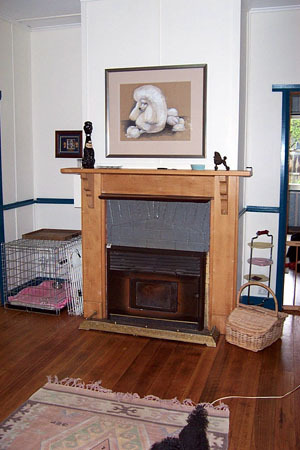 The grey painted brick on the fire place. The blue dado rail and the white walls. I apologise for the sizes of the images. I no longer have the original files in some cases and they’re all different sizes. 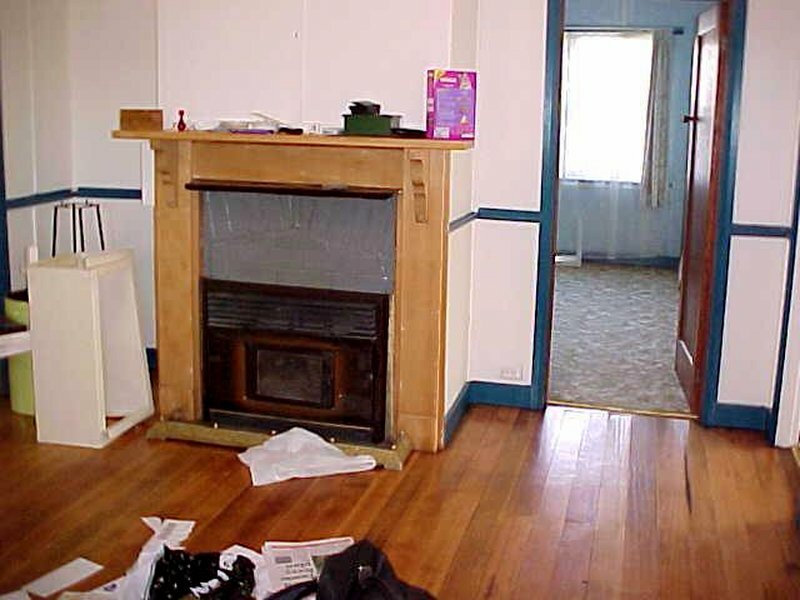 The other side of the fireplace in what is now the purple room – The walls were sponged blue over white. Not a good job. 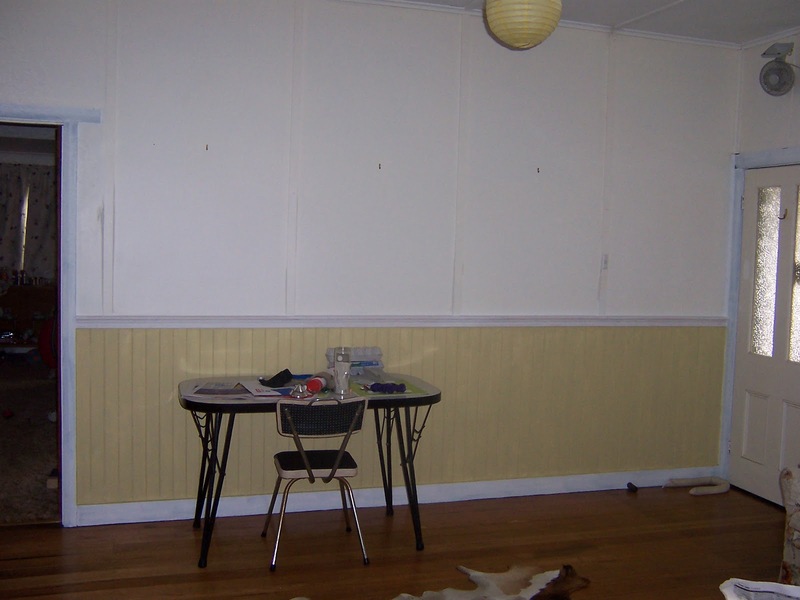 There was a carpet in this bedroom when I first moved in. 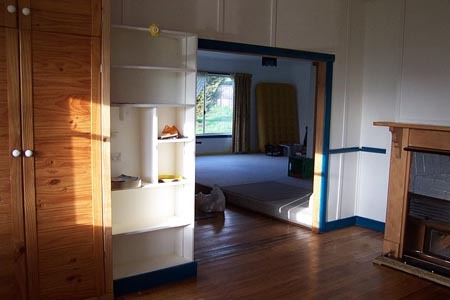 My first job was to remove the carpet, sand the floorboards and varnish them. It looked a bit better once I cleaned up, but not much. 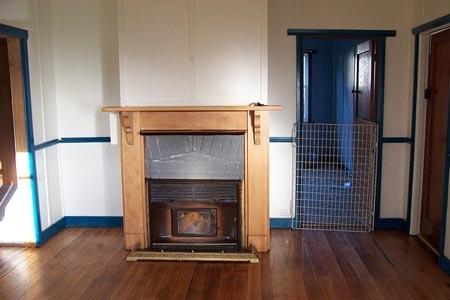 The dog pen side was to keep the dogs off the floor in the bedroom till it dried. 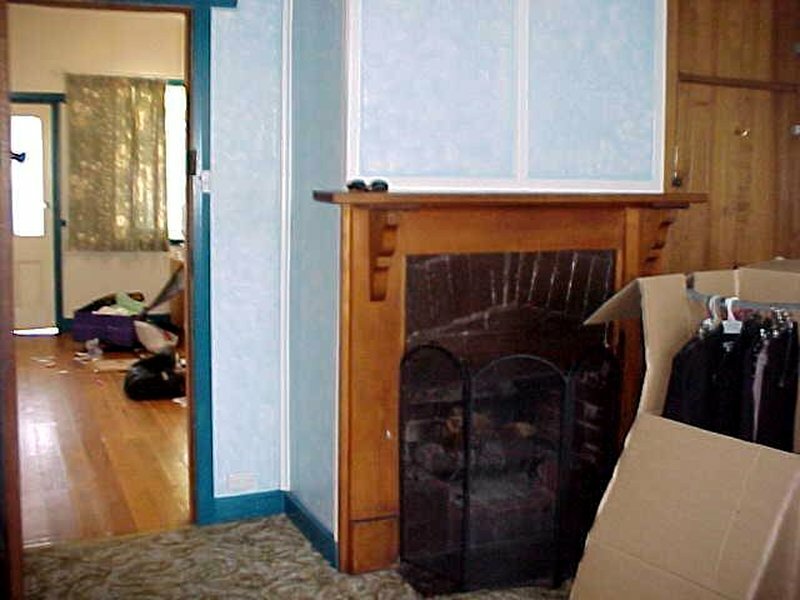 The fireplace surround was nice timber, but they’d painted the original old bricks a gloss grey. 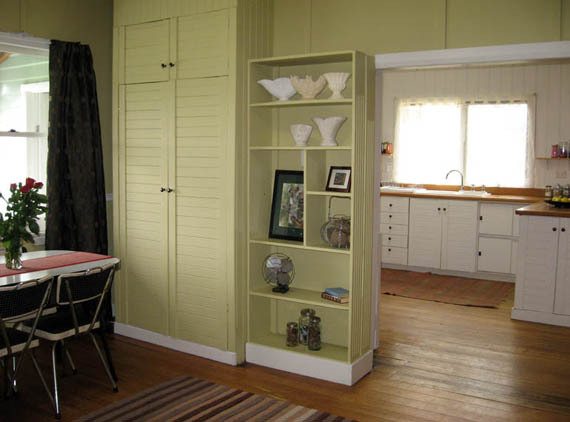 The pantry cupboard was lacquered pine like the entire kitchen. 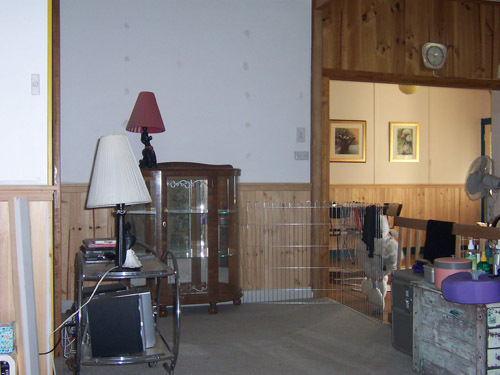 Having moved in, I started to make the space work for me… Furnishing with dog crates! 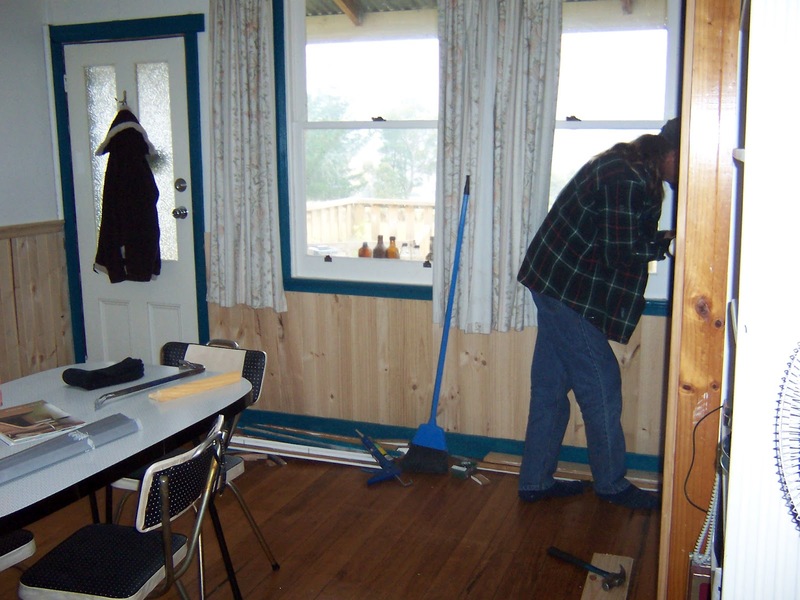 Below is Greg putting in the pine lining for me. I have to admit, his faults aside, Greg really can do things when he put his mind to it. He is a very talented man. 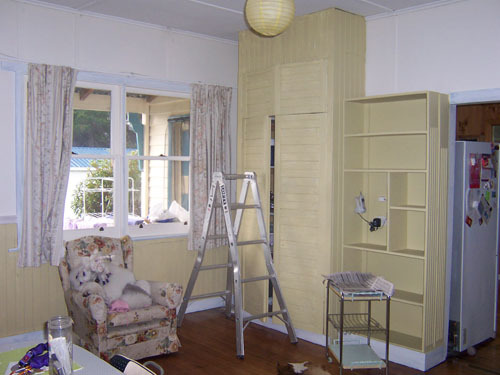 Back to the dining room make-over. 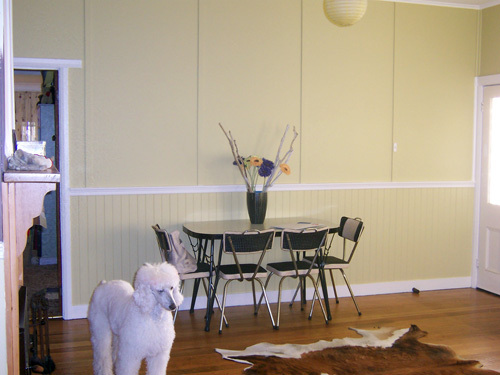 The wood panelling was put up in the living room and dining room at the same time. It made sense. 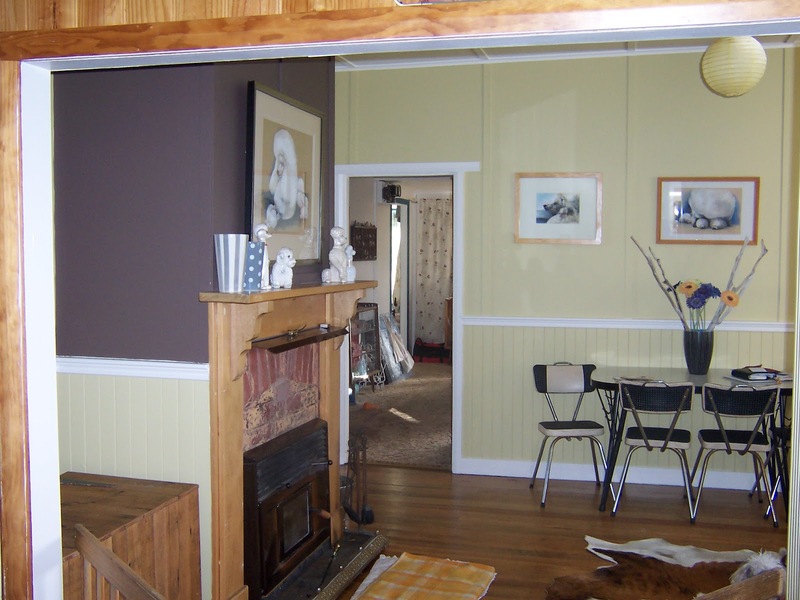 Similar to the living room, the walls above and the panelling below were both painted the same colour and the dado and all woodwork was painted Antique White USA. I stripped the grey paint off the bricks using paint stripper and exposed the original bricks and some of the old cream colour used to paint them in the past. It looks a bit messy in the photos but I love the texture of those old bricks. 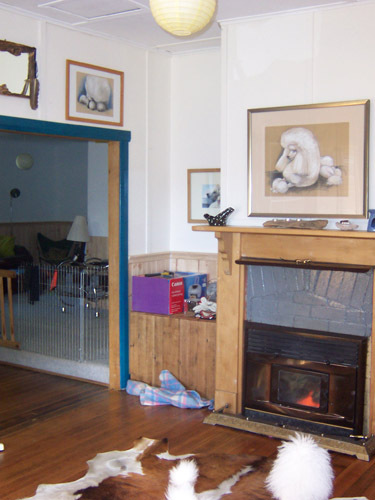 The built in wood heater in this room works beautifully and is positioned in a way that serves to heat the entire house. I’ve just replaced the old one with a refurbished 2nd hand one and now its in better shape than ever. 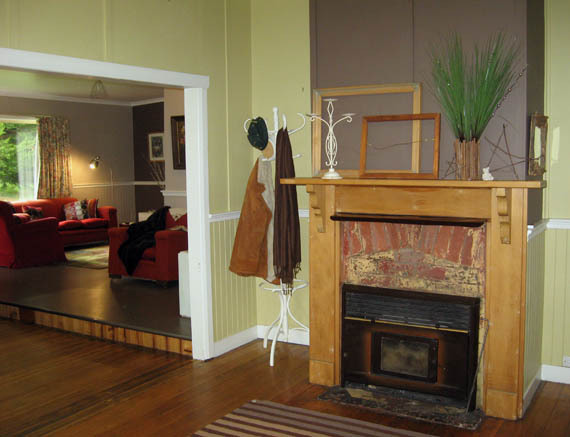 The fireplace was painted Columbia to match the far wall in the living room to tie the rooms together further. 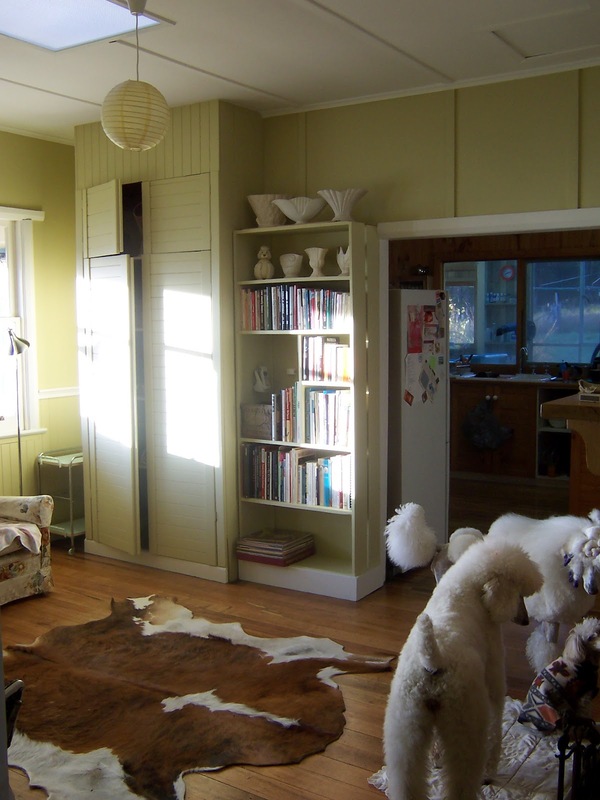 I painted the pantry and the built-in bookcase the same colour as the walls for a more uniform feeling in the room. 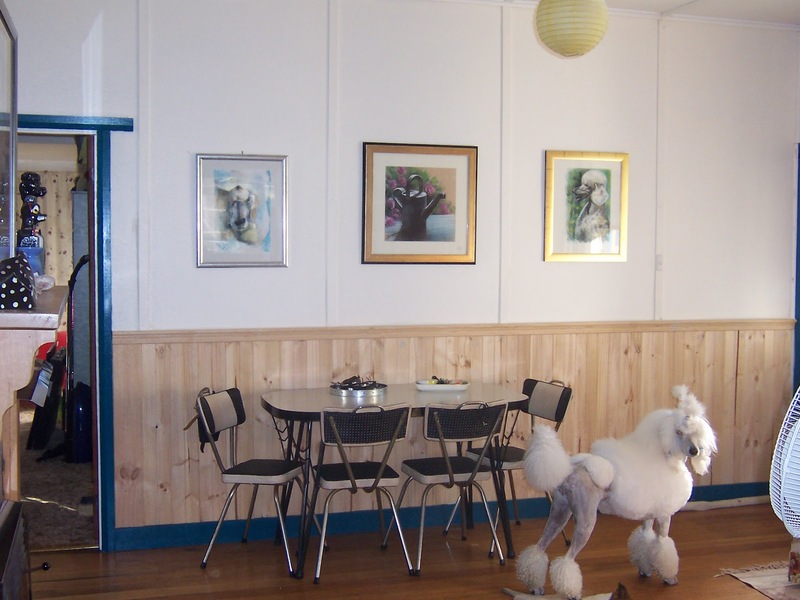 The floorboards in the dining room and kitchen were all in pretty good condition, they could do with a sand and polish but to be honest, I like the warn, less perfect look. 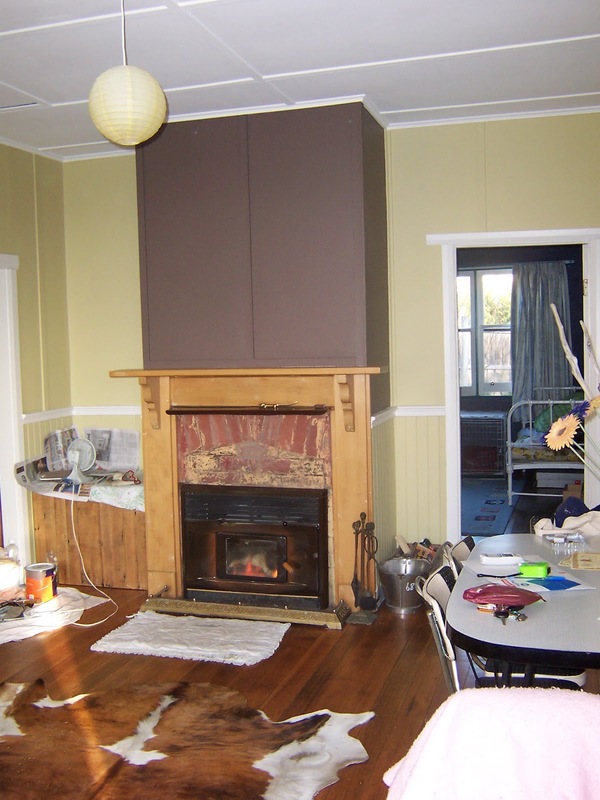 I always have a rug in the dining room for warmth and with the fire going in winter. So here it is now. 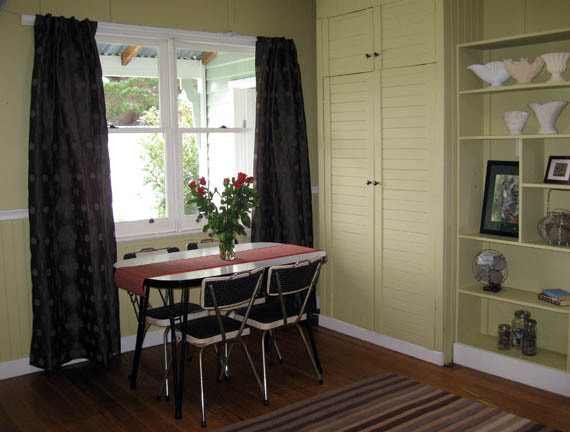 New curtains, re-arranged furniture, my 60s kitchen table and chairs and you have to admit, it looks spectacular.